Outdoor Eyes Cards (www.outdooreyescards.com) has over 650+ nature photographs in 11 categories to custom-design your own Ecards! The categories are Butterflies, Wildflowers, Sunrise / Sunset, Wildlife, Mountains, Birds, Happy Birthday, Happy Anniversary, Get Well, Love, Holidays and many more. Many of the photographs are from Rocky Mountain National Park. With so many of my friends telling me that I should make prints or cards with my outdoor photographs, I decided this would be a perfect way to share my photographs with everyone. Outdoor Eyes Ecards are quick and easy to use. You can select a photograph, write a message and send it out to friends or family within a minute. Businesses can even use these Ecards as Thank You cards for their clients, guests or customers. I will be constantly adding new photographs as I take them. In this initial release, I have selected my favorite photographs. 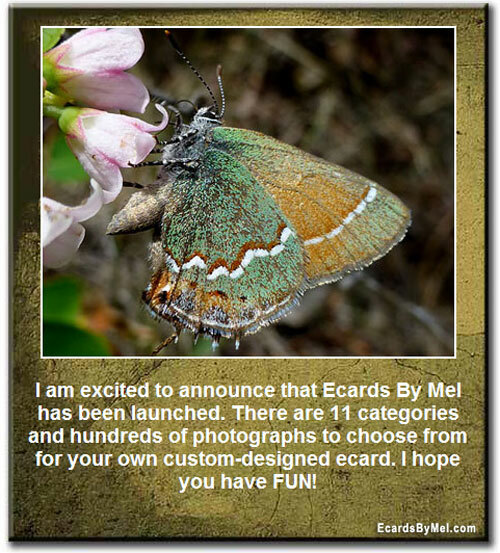 A sample of a Butterfly Ecard is shown above. Have some fun and pass the Outdoor Eyes Ecard link forward to all your friends and family! If you have any ideas or suggestions, please let me know! Click Here For Outdoor Eyes Cards.